“Freely you received, freely give.” (Matthew 10:8) Jesus told us that since we’ve been blessed we should bless others. I am happy to provide a blessing to others in the form of free Bible study software! e-Sword provides a wealth of Bible translations, commentaries, dictionaries, and related resources, most of which are free. Additionally, a good selection of copyrighted resources are available for purchase from the respective copyright holders. This review addresses version 7.7.7, which is the version I have installed under Linux using wine on this ubuntu 8.10 machine. Newer versions have replaced this version, but the comments below generally apply to the current version as well. 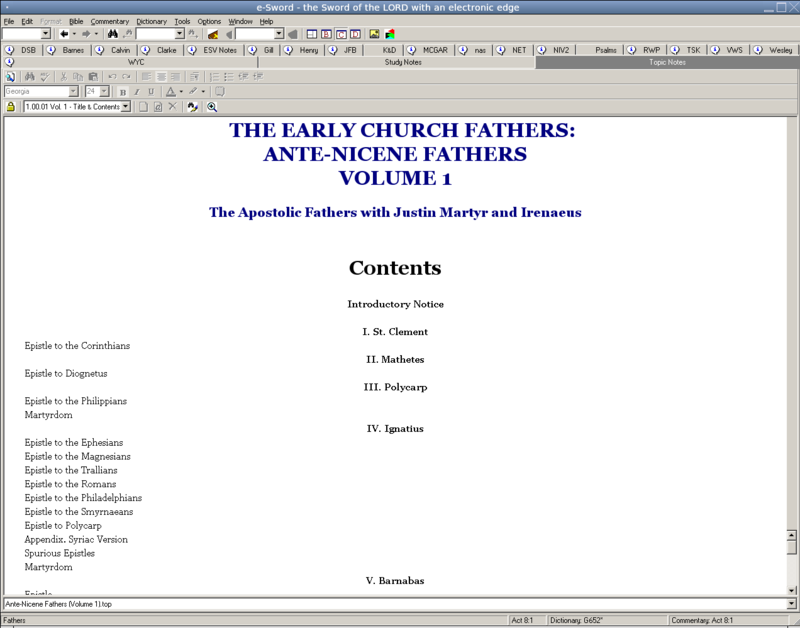 The installed resources are presented in the e-Sword software in a well-designed layout that makes the tool a joy to use. 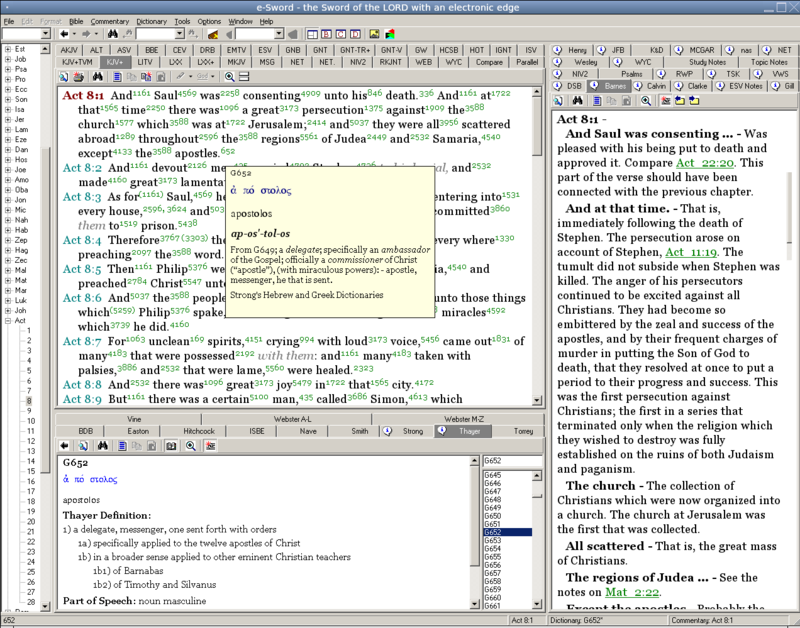 The main window includes three main areas, containing the Bible text, the selected commentary, and the selected dictionary. Each of the three sections can be expanded to fill the window. 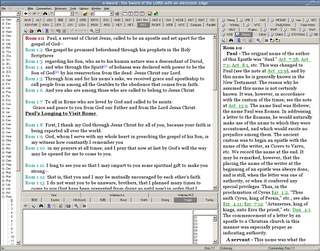 A tool for navigating the Bible appears on the left side of the screen. When you select a book, chapter, and verse, the Bible and (optionally) commentary windows are advanced to the selected passage. 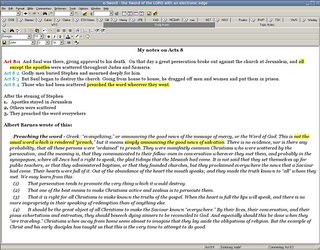 When a particular commentary has comments on the selected verse, an “I” information icon appears in its tab, making it extra convenient to review what various commentators had to say about the passage. One of the available commentaries is the Treasury of Scriptural Knowledge (TSK). This commentary is really an extensive cross reference directory, showing other passages addressing similar concepts, enabling the scriptures to become a commentary on themselves — the best of all commentaries. Throughout e-Sword, Bible references act as hyper-links so clicking on the link takes you to that passage in the Bible window. Alternatively, you can see the referenced passage in a popup bubble by hovering the mouse over the link. 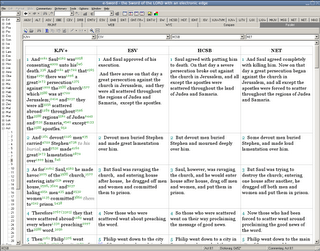 The King James Version is provided with Strong’s concordance links. Hovering over these links results in a popup bubble with the Strong’s definition for that word in Hebrew or Greek. Clicking on the link takes you to that word in the Strong’s and/or Thayer dictionary. 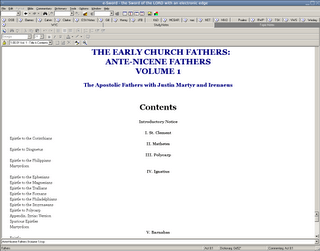 Among the many resources available are topic files (.top) which cover a plethora of topics, including the nine-volume Anti-Nicene Fathers, the Wars of the Jews by Josephus, Fox’s Book of Martyrs, and many other documents from the early church period, as well as many from the early Reformation Movement and the modern period. Bible searches can be conducted across a single version, or across multiple selected versions. A parallel view is supplied enabling you to view up to four versions of your choice side-by-side. There is also a built-in editor with most of the essential features of a word processor, which is a convenient way to create your own study notes. Other features include a Step reader, a graphics viewer, a scripture reading tool, a scripture memory tool, and a prayer request tool. 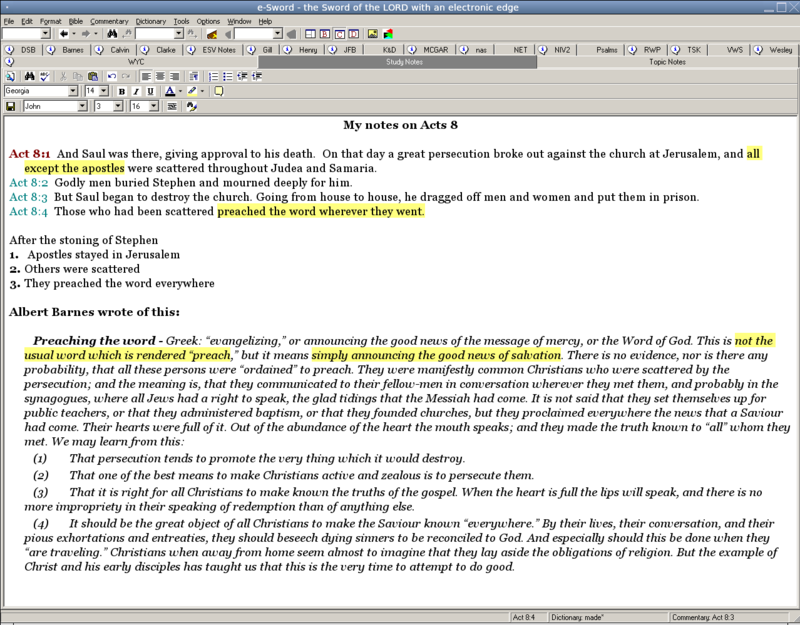 One limitation of the e-Sword scripture reading tool is that it does not offer an option to use paragraph-style presentation of the scripture. The text is always shown with each verse starting on a new line. 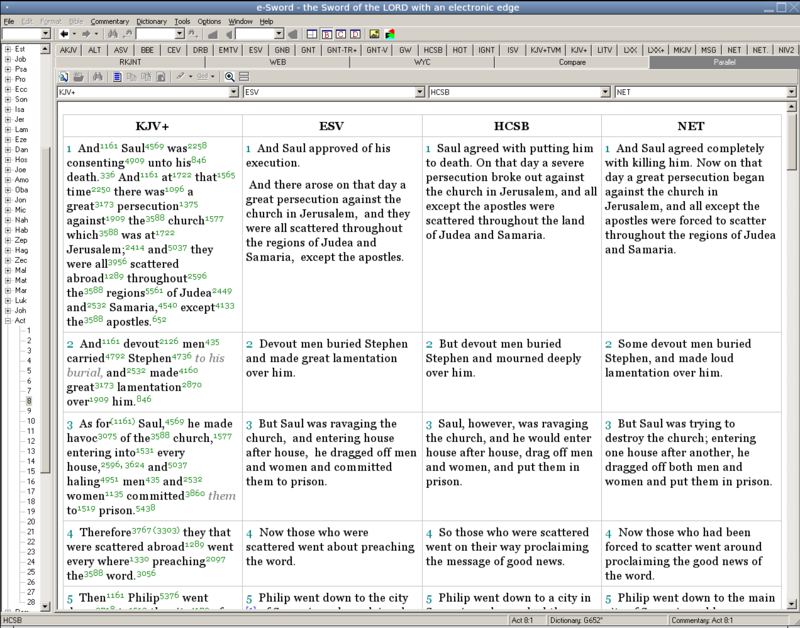 This is how I prefer it anyway for Bible study, but some people prefer the paragraph style for reading. 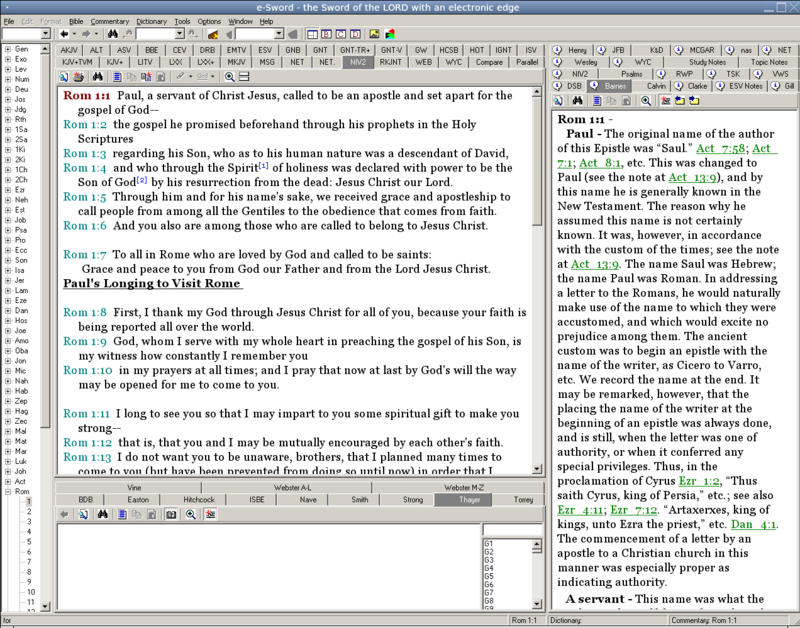 There are other free Bible software packages for Windows and/or Linux. The Sword Project is an open source Bible study framework on which multiple Bible study applications have been built. The Sword Project applications can be built for a variety of operating systems. The Sword Project and its companion interfaces provide many similar features, but lack some of the paid copyrighted resources. In particular, the NIV is not permitted to be used in any open source software package. 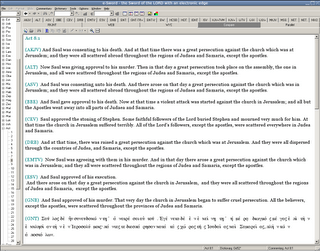 Another option is The Word, a closed-source Windows Bible application. I hope to try The Word in the future and perhaps will offer a review of it at that time. Currently The Word has some of the same limitations as The Sword Project regarding modern copyrighted Bible translations. But perhaps that will change in the future. I have used e-Sword for many years and am quite satisfied with it for my Bible study purposes. However, there are enthusiastic users of all of these applications. Those who invest their time and skills to provide these tools free of charge are to be commended and appreciated. If you should decide to use one of these, I urge you to make a donation to support the tool of your choice. Matt 24:45-51 “Who then is the faithful and wise servant, whom the master has put in charge of the servants in his household to give them their food at the proper time? It will be good for that servant whose master finds him doing so when he returns. I tell you the truth, he will put him in charge of all his possessions. But suppose that servant is wicked and says to himself, ‘My master is staying away a long time,’ and he then begins to beat his fellow servants and to eat and drink with drunkards. The master of that servant will come on a day when he does not expect him and at an hour he is not aware of. He will cut him to pieces and assign him a place with the hypocrites, where there will be weeping and gnashing of teeth. 2 Tim 3:16-17 All Scripture is God-breathed and is useful for teaching, rebuking, correcting and training in righteousness, so that the man of God may be thoroughly equipped for every good work. Acts 20:26-27 Therefore, I declare to you today that I am innocent of the blood of all men. For I have not hesitated to proclaim to you the whole will of God. A primary responsibility of congregational leaders is to teach them the Bible. To me that means that we must teach the “whole” Bible, not just selected excerpts. If not, then who is responsible for teaching it? Our congregation’s schedule provides for three teaching opportunities each week, plus occasional events outside the regular schedule. We are further limited by the fact that we do not own a building, so scheduling additional opportunities requires us to find (rent) a place. When we do teach, we have one or two large classes to meet the needs of the entire congregation. That just seems inadequate to me. If we continue in this manner, how will we ever get the entire church taught the entire Bible? We need a new approach. The internet provides a possible answer. Adoption of online training has exploded in the past decade. Tens of thousands of courses have been offered using an open source course management product called Moodle. In turn, Moodle has been interfaced to various social networking environments where classes can be conducted in a social setting. Facebook users can take classes using the PodClass interface. For a more futuristic environment, SecondLife users can take classes through the Sloodle interface. I’m dipping my toe into the pool. Just a little. I would love to find a way to provide additional Bible study opportunities in the local congregation — ways that don’t require people to be physically present at the same time, and that don’t require renting a facility. The technology seems to be available. I want to learn how to apply that technology effectively, combining both online and “real life” interactions and sound adult educational principles. I want to evaluate whether it is a feasible way to enhance our existing Bible teaching methods. I would like to hear from folks who have experience in these or other similar courseware environments. What worked, and what didn’t? What could have been done better? You are currently browsing the archives for the Bible study resources category.